I haven’t found a proper definition of emotional eating online, but I would describe it as a way to modulate emotions, stress and boredom through food. This kind of eating, like binge eating, is not based on hunger. Its causes are quite different. One of the main causes of binge eating is dieting. Learn more about binge eating causes at What is binge eating? . Emotional Eating Causes: why do people eat emotionally? Emotional eating is often a strategy for providing a sense of satisfaction or relief, whether you’re celebrating something, comforting yourself, filling a hole in your heart or rewarding yourself for something. In other words, it’s a way either to suppress negative emotions or their causes, or to recollect positive feelings. When I was an emotional eater, I had food rituals. I would go and buy a pack of cookies and a bag of candies and eat them at night in front of TV. It was something to look forward to during the day and a great way to unload the frustrations and emotional discomfort of the day. It somehow helped me get by from day to day. I was homesick and I felt scared away from home. I felt like I couldn’t take care of myself. I didn’t want to feel my emotions because I felt clueless about how to handle them. I was debilitated with chronic anxiety every other week, but my little eating routine, smoking and watching TV kept me functioning in this dull, zombie-like state. I was not myself most of the time, putting on a fake smile and stealing moments of fun at parties. All this was just an escape mechanism. If you find my story familiar, you will know I gained a lot of weight and lost a few teeth to cavities in the process. Eating emotionally can also be a by-product of trying to be perfect. I know a woman who is trying so hard to be the perfect wife, mother and career person that her impossibly high standards are making her overexert herself to the point where there is no pleasure in her life. The only pleasures left for her are her eating rituals, which she blames herself for holding on to.She rarely feels good enough and describes herself as being like a “fat cow”, who just can’t control herself. . Then she tends to strive harder for ‘perfection’, causing herself more frustration and removing the last drips of pleasure left in her life. 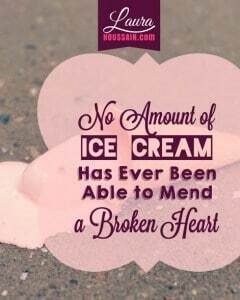 It can also be a way to handle depression. I know I used it when I was losing the man who was the love of my life at the time; I just couldn’t see a future without him and I was eating to comfort the anxiety his leaving was causing me. I knew our partnership hadn’t been working for years, but I was holding on to it like my life. I was really depressed and felt powerless.. Emotional eating can also take the shape of stress eating, comfort eating, mindless eating or boredom eating. You may have learned it from your parents, siblings, or friends. I know I learned it partially from my roommate. My parents are not emotional eaters, though they used to be heavy smokers. I think that the root causes of emotional eating are often feelings of inadequacy, of not deserving happiness or pleasure, and of powerlessness over one’s thoughts and emotions. In other words, it’s a form of self-rejection or a lack of self-love, presence and self-support. Some aspects may be stronger than others in individual cases. Often, these emotional eating causes stem from a set of beliefs and habits which were forged during childhood. That doesn’t necessarily mean that because you suffer from emotional eating you must have had toxic parents. I have a friend who has a sweet family but she has always felt like a misfit in her clan. So much so that she often expected to be excluded. Often this felt like an emptiness in her heart that she needed to fill urgently with candy. She’s overweight and unhappy because of it, but she just feels she can’t help herself. For me, emotional eating was a symptom of the belief that I couldn’t take care of myself. I felt unworthy, not good enough. I expected to fail and to be rejected all the time. This caused me lots of stress and negative thoughts that I could only suppress with compulsive eating, smoking and fantasizing. I was completely powerless. Uncontrollable food cravings are the most common symptoms. 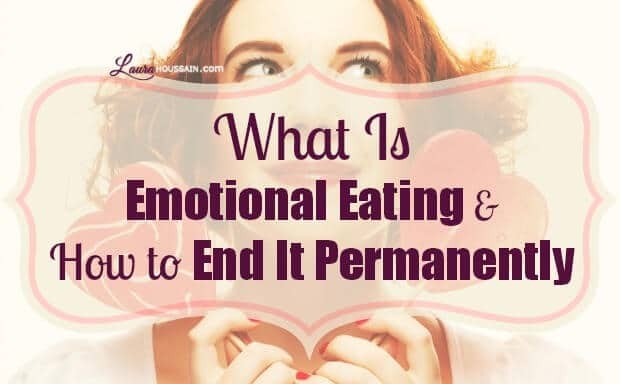 Emotional eating triggers can be by specific events or the need to release a certain emotion overload, like stress or the desire to reconnect to good feelings when feeling lonely or unhappy. 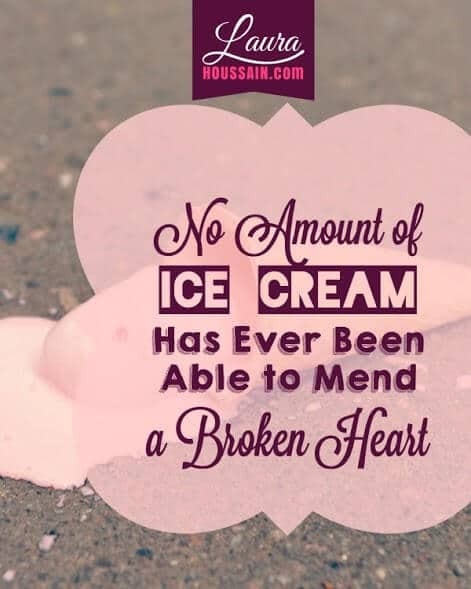 For example, some people use ice-cream to suppress their sadness after a breakup. I also know a man who just went straight to the food store and started munching in front of TV right after being fired. That was his way to handle stress. I ate very specific cookies that tasted like home to alleviate my homesickness. Some people experience a sudden surge of food cravings or, as in my case, it can build up during the day until it becomes completely impossible to repress. What is certain is that this kind of eating is completely disconnected from hunger. Physical Hunger is a body signal. It comes gradually. It’s a feeling in the stomach. It can make you feel light-headed and make your stomach growl. The longer you wait before eating, the stronger these feeling become. They just don’t dissipate. Hunger goes away when you’re full. The stomach relaxes. Food tastes more bland. At this point, a normal eater will stop and take the time to enjoy food. “Emotional Hunger” is basically a thought tied to an emotion. It is disconnected from the body and the stomach. It can come very suddenly. It usually requires very specific foods. Someone may eat quickly or very slowly, in an absent minded way, but in both situations they are in a trance-like state. Denial – “it’s only one bite… only this time” – or resignation – “I just can’t be bothered”, “I just need this” – takes over. The emotional eater stops eating only if a certain sense of pleasure or relief has been reached. Lack of hunger or fullness will not influence this behavior. Once the feeling of relief or satisfaction has been reached, the emotional eater usually feels like (s)he is coming out of a trance, and realizes what just happened. At this stage guilt – “I shouldn’t have done that” – and self-hate – “I hate myself. I’m so dumb…” – sets in. Emotional hunger will make your emotions stronger if you ignore it whereas physical hunger will make you feel physically uneasy if you ignore it long enough. To make things worse, emotional eaters often confuse emotional cravings with real hunger, ending up feeling guilty for needing food. It can become a never-ending vicious cycle when the emotional eater eats to alleviate the guilt of overeating. The basic principles are to learn to handle your emotions differently by paying attention to your feelings and internal dialogue, welcoming your feelings and taking action to give yourself the support and life you deserve. As a highly sensitive person my first desire was to make my feelings go away. I’ve tried that for years, only succeeding in not having the life I wanted, feeling at the mercy of my emotional loops and other people’s behaviors. My emotions would fluctuate greatly at the slightest sign of rejection. I just couldn’t handle the idea of not being loved. After years of tribulations, I finally found a technique that helped me reduce the intensity of my emotions, including cravings, in minutes. I share it with my newsletter subscribers so if you haven’t yet done so, please subscribe to my newsletter now. I was happy because I could reduce my emotions to a manageable level and start taking action without being riven or paralyzed with fear. This was really empowering and I enjoyed going beyond my comfort zone and watching my life expand. Yet, I was not fully satisfied with the results I got. I dug a little deeper and discovered ways to look at my thoughts with complete detachment; not only that but I was able to release them in the process. Before I knew it I had created a method for highly sensitive people who, like me, feel at the mercy of their emotions. You will find all the concepts of my method in this blog. I’m not withholding anything. I feel that learning to welcome emotions fearlessly, understanding where they come from and assessing their validity is an extremely empowering process. Just imagine for a second, never being afraid to feel anything, including cravings, fear, guilt and shame and having a choice of what you’re going to do with those feelings and about them. That usually means taking some form of action. This is the most empowering process that I know. It will turn every craving into an opportunity to build your self-confidence, choose who you want to become and love yourself like never before. I don’t have any words that can describe the difference between the zombie-like state I felt while being a depressed, home-sick, overwhelmed emotional eater and the woman I am now. I still have fears and moments of doubts but the more I acknowledge them, the more open to joy and love I become. If there is one thing I want to convince you about, it is that no matter how comfortable you may feel today about suppressing your emotions with food, you are really being robbed of the joy of loving yourself, being there for yourself and taking ownership of your own life. One of the side effects of emotional eating, besides gaining weight, hurting your self-esteem and your health is that you get away from yourself. This means you lead a life outside of yourself and you can never be satisfied this way because it’s your job to make yourself happy and no one can do it better than you. Also, you cannot suppress bad feelings without suppressing good ones as well. But if you know how to handle emotions, you can move very quickly from despair or self-hatred to enthusiasm and joy. It’s as if you can go to an emotion garden and pick the ripest and tastiest feelings you can find. One last thing. Because your brain becomes accustomed to the rushes foods give you, as an emotional eater you end up enjoying food far less than a normal eater does, depriving yourself even more of one of the pleasures of life. In France, where I come from, food is sacred. We eat at table. We savor food. It’s a real pleasure to us and we can enjoy it without being overweight. To sum up, if you’re serious about overcoming emotional eating learn to connect to your emotions, welcome them, challenge them and shift them. Your life will then expand beyond limits you cannot even conceive today. For further emotional eating help, please subscribe to my newsletter now. Enter your name and email in the form below. You will immediately receive a training video showing you how to stop cravings in minutes. I have been suppressing this battle for 25 years now. at some point I addressed it and got myself under control. I can’t say that at this point in my life. Self awareness had brought me to seeking help. I hope your newsletter can help me through this. Thank you for sharing that. Did you get yourself under control by suppressing this battle for 25 years? If so, congratulations you have an exceptional willpower. I think that you’re going to like what’s coming to your email box. effortless, easy and different, you are going to be glad you’ve subscribed. And if you want free online support, join my free community here. I really love everything about your blog. Your voice, your delivery, your content. Everything. I suspect that my dad is an emotional binge eater (not a professional but 99.9% sure) and I am at a loss of where to go from here. I’m still in the stage of learning everything I can about it. Out of fear of losing him (from the side effects of being unhealthy), we (me, brother, grandparents) have voiced our concern and have strongly encouraged activity and healthier eating choices…but obviously those things are only being counter-productive because it only causes him more stress. I am very excited to read through your whole site and learn all I can to hopefully get his life going in a more positive direction…one filled with love and the right kind of support. Thank you for taking the time to share all this! !